So why the change of heart by Trump concerning Romney?? It’s simple, Trump sees that Romney is riding high right now after Florida and that Romney will more than likely win the next couple of primaries and caucuses (Nevada, Maine, Colorado, Minnesota, Missouri, Arizona, Michigan and Washington State). 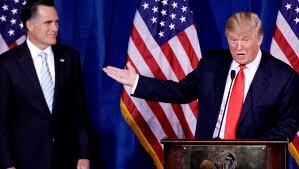 The Donald sees a perfect opportunity for him to endorse Romney and then spin it that HIS endorsement put Romney over the top. Trump doesn’t REALLY care about endorsing Romney or anyone, all he cares about is himself and how he can make himself important. It was almost a week ago that the Romney’s staff were giving each other high fives after he destroyed Newt in the Florida debate. Singing their own praises about how THEY turned around Mitt’s campaign strategy and shut Newt down. So they follow that up by letting Trump make a show out of his silly endorsement?? 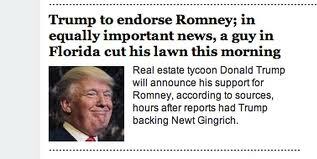 If I was Newt I would take this opportunity to slam Romney and talk about how these uber rich guys don’t really care about the poor!